Professor Charles Thomas CBE DL DLitt FBA FSA was a British historian and archaeologist who was Professor of Cornish Studies at Exeter University, and the first Director of the Institute of Cornish Studies, from 1971 until his retirement in 1991. He was recognised as a Bard of the Gorsedh Kernow with the name Gwas Godhyan in 1953. He was born in Camborne in Cornwall and was the author of dozens of books and hundreds of academic articles. 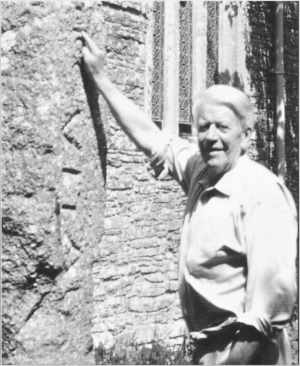 In 2008 he was awarded the Jenner Medal, presented to individuals in recognition of a serious body of work relating to Cornish history. He was also the former President of the Council for British Archaeology, the Society for Medieval Archaeology, the Royal Institution of Cornwall, the Cornwall Archaeological Society, the Cornish Methodist Historical Society and The John Harris Society. He lived in Cornwall and was married to the crime writer Jessica Mann. Charles sadly passed away in April of 2016 after a short illness. He will be greatly missed by many.